His greatest hits, collected in one lavish, full-color volume. Now in paperback, at a ridiculously cheap price, and with many additions. It includes all the work that first appeared in the three "little" books, Existencilism, Banging Your Head Against A Brick Wall and Cut It Out, together with a whole plethora of new work, including his decorations on the Israeli apartheid wall. 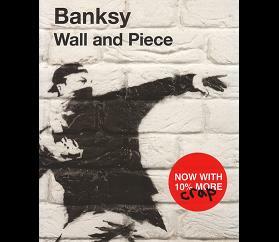 There's a fair amount of text from Banksy himself, which greatly adds to the quite wonderful stencils within.